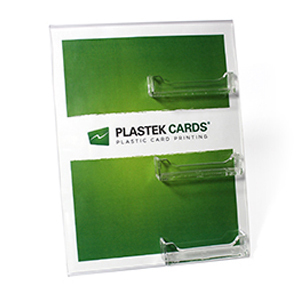 Gift Card Display Stand | Clear Acrylic | Three Pockets | 8.5"x11"
8-1/2″ wide x 11″ high three pocket display. Larger size provides more versatility for branding and graphics, which easily slide in and out. Three pockets fit standard gift cards or loyalty cards. Holds up to 15 cards per pocket.